correct as of 9 September 2006.
correct as of 7 March 2008. 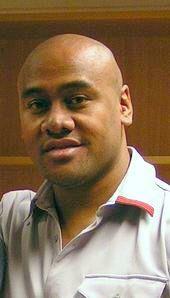 Jonah Tali Lomu, MNZM (born 12 May 1975) is a former New Zealand rugby union player. He had sixty-three caps as an All Black after debuting in 1994. He is generally regarded as the first true global superstar of rugby union. He has had a huge impact on the game. He was inducted into the International Rugby Hall of Fame on 9 October 2007, and the IRB Hall of Fame on 24 October 2011. Lomu burst onto the international rugby scene during the 1994 Hong Kong Sevens tournament and was widely acknowledged to be the top player at the 1995 World Cup in South Africa even though New Zealand lost the final to the host Springboks. At one time Lomu was considered 'rugby union's biggest drawcard', swelling attendances at any match where he appeared. He is one of the Rugby World Cup all-time top try scorers with 15 tries, a record he shares with Bryan Habana of South Africa - despite never winning a World Cup. He has played for several domestic teams, in the Super Rugby, NPC and later the Magners League competitions. These included the Auckland Blues, Chiefs and Hurricanes, and Counties Manukau, Wellington and later North Harbour and Cardiff Blues. He made a comeback after undergoing a kidney transplant in 2004. Lomu represented New Zealand in the national under-19 side in 1993, as well as the under-21 side the following year. He first came to international attention at the 1994 Hong Kong Sevens tournament as part of a team including Eric Rush. Despite having just two All Black caps, Lomu was included in the squad for the 1995 World Cup in South Africa. Lomu stunned international rugby audiences (and unsuspecting players) at the 1995 World Cup, when he scored seven tries in five matches, including four in the semi-final against England. In his first ever World Cup match, against Ireland in Johannesburg, he scored two tries in the 43–19 win. In the following match—against Wales—Lomu was replaced during the game, and did not score any tries in the 34–9 victory. He was rested for the final pool match against Japan. In the All Blacks' quarter final, Lomu scored a try in the 48–30 win over Scotland at Loftus Versfeld. He shocked the 51,000 that packed into Newlands in Cape Town to see the semi-final against England, as he notched up four tries in the 45–29 defeat of the English, including a try in which he ran straight over the top of England fullback Mike Catt. His style of play reduced one New Zealand commentator, Keith Quinn, to gasps during the match against England. After the game, England captain Will Carling said: "He is a freak and the sooner he goes away the better". In 2002 the UK public voted Lomu's performance #19 in the list of the 100 Greatest Sporting Moments. Following the win over England, the All Blacks reached the World Cup final match at Ellis Park against South Africa (the Springboks), but despite his efforts, Lomu could not score a try against the South African side. During this game he was tackled near the try-line by Joost van der Westhuizen. The game went to the hosts, who scored a drop-goal in extra time to defeat the All Blacks 15–12. Lomu has scored tries against every major test playing nation in World Rugby except South Africa and Wales. In interviews after 2003, Lomu revealed that he was already suffering from the effects of nephrotic syndrome during the 1995 World Cup. As a consequence of this serious and chronic kidney illness he was completely drained and often bedridden for entire days in between Cup games. It was agreed with the All Blacks doctor John Mayhew that his illness, at that time undiagnosed, would be kept secret and it stayed that way for most of his career. In the Clint Eastwood movie Invictus (2009), which is about Nelson Mandela and the South African rugby team in 1995 World Cup, Lomu is portrayed by Isaac Fe'aunati. In the first match after the World Cup loss to South Africa, the All Blacks took on Australia at home at Eden Park. Lomu scored New Zealand's only try in the match, which they won 28–16. In the return match, held at the Sydney Football Stadium to decide the Bledisloe Cup, the All Blacks won 34–23 despite trailing at half-time, with Lomu scoring a try. Lomu's scoring for New Zealand continued later that year when he scored two tries in the All Blacks victory over Italy in Bologna. Lomu also played against the French Barbarians in November in Toulon, as well as two matches against French selections. Lomu played in the first Test against France in Toulouse, which was won through penalty goals. In a subsequent match against a French selection, Lomu scored two tries. He scored a try in the second and final test against France in Paris. Prior to the start of the first Tri Nations Series, Lomu played for the All Blacks in matches against Samoa and Scotland, scoring in the Scottish match. The All Blacks also hosted Australia in Wellington; defeating the Wallabies 43–6, with Lomu getting three of the tries. The 1996 Tri Nations was the first of its kind, and launched with the advent of professionalism in rugby. A close victory over South Africa in Christchurch was followed by a 32–25 win over the Wallabies, in which Lomu scored. The wins ensured the All Blacks became the first ever Tri Nations champions. Lomu played three other matches for the All Blacks following the Tri Nations that year; against Currie Cup sides in South Africa: Eastern Province, Western Transvaal and Griqualand West. At the end of 1996, he was diagnosed with a rare and serious kidney disorder, which saw him take time off from the sport. As such he did not play in the 1997 Tri Nations Series, but was included in the All Blacks tour of the northern hemisphere at the end of the year. Lomu played in the two warm up matches, scoring tries against Wales 'A' and Emerging England. He played the first test against England at Old Trafford, as well as the test against Wales at Wembley Stadium, and the second match against England— he did not score in any of the three games. At the 1998 Commonwealth Games in Kuala Lumpur, he won a gold medal representing New Zealand in the Sevens Rugby event. The English rugby team came to New Zealand the following year for a two test series. Lomu played in both of the matches, scoring in the first, which was a 64–22 win in Dunedin, but not in the second test won 40–10 by the All Blacks. Lomu's 1999 international season kicked off with a warm-up match against New Zealand A, which was followed by a game against Samoa in which Lomu scored one of the All Blacks' nine tries. Lomu came on late in the first game of the 1999 Tri Nations Series, which was a 28–0 win over South Africa, and at one point took eight men to bring him down. He again started from the bench in the subsequent game against Australia which the All Blacks also won. Lomu started from the bench in the following match against the Springboks in Pretoria, though he came in early in the 34–18 win. He was introduced at near half-time in the final Tri Nations game against Australia in Sydney, though the game was characterised by New Zealand errors, and Australia won the rainy affair, in front of 107,042 supporters. Despite the loss, the All Blacks were crowned Tri Nations champions. He scored eight tries at the 1999 World Cup. In New Zealand's first pool match of the tournament against Tonga he scored two tries, scoring again in one of his finest matches in pool play against England. Lomu scored his second double of the tournament in the third and final pool match against Italy. The All Blacks, finishing at the top of their pool, proceeded to the quarter-finals, where they defeated Scotland, where Lomu scored one of New Zealand's four tries. Lomu scored twice in the semi-final match against France, though it was not enough to see them through to the final, as France went on to win 43–31. Through his career, Lomu has scored eight tries against England – more than any other All Black. Lomu also holds a record of 15 tries in World Cup tournaments, which he shares with Bryan Habana of South Africa. Following the World Cup, there was speculation that Lomu would be moving to play American Football in the National Football League, or continue to play rugby in the English Premiership. None of the speculation materialised and Lomu stayed in New Zealand. Jonah Lomu in training in 2001. After playing the 100+ victory over Tonga, Lomu and Stephen Larkham to tip-toe down the line and score the winning try". The match was followed by a victory over South Africa, and then a re-match of the thrilling Bledisloe Cup game, which Australia won by just a single point, 24 to 23. A barn-storming Lomu was stopped short of the line early in the second half in the final match against South Africa. The Springboks eventually won, 46 to 40. The All Blacks finished second on the table, with Australia winning the Tri Nations. Lomu played in one other test that year; against France at Stade de France in November, which the All Blacks won 39 to 26. Lomu also led the New Zealand Sevens team to victory at the 2001 Sevens World Cup, filling in for Rush, who suffered a broken leg during the competition. In the lead up to the 2001 Tri Nations Series, the All Blacks played Argentina and France at home, Lomu scoring a try in the French match. Despite causing havoc for the Springboks, no tries were scored in the opening match of the Tri Nations, which was won on penalty goals by the All Blacks. Lomu played his 50th test for the All Blacks at the Carisbrook 'House of Pain', scoring a try in the second minute of play. The Wallabies spoiled the party however, winning 23 to 15. This was followed by a win over South Africa, and loss to the Wallabies at Stadium Australia. During the 1999 off season, Lomu transferred to Wellington and won many plaudits by signing up with Wainuiomata RFC which at that time was a second division club. Lomu played his debut match against Northern United scoring twice and attracting a bumper crowd and followed that up with a further appearance in 2001. Supporters and club members were particularly proud when Lomu wore the green and black club socks when he played for the Barbarian F.C. in 2000. At the end of the year, the All Blacks played Ireland at Lansdowne Road in Dublin. Lomu was a central figure in the 40 to 29 win, setting up Aaron Mauger for his debut try, and taking an inside pass to blast through for one of his own. The All Blacks end of season tour continued at Murrayfield in Edinburgh, where they defeated Scotland 37 to six, with Lomu contributing one try. In the final match of the tour, the All Blacks played Argentina at the River Plate Stadium. Lomu put the All Blacks in front after Argentina took an early lead, brushing off four defenders to score. In the end, New Zealand won the match by a score of 24 to 20. In his first test of 2002, he came off the bench in the second half to score a try in a match against Italy. He was again injected into play from the bench in the first of a two test series against Ireland in New Zealand; setting up the All Blacks second try coming on in the last fifteen minutes of play. Lomu was back at his usual starting position for the second test against the Irish, which New Zealand won 40 points to eight. Lomu did not score in the subsequent match against Fiji; though he did however make a trademark run down the wing, setting up Christian Cullen's third try in the match. Lomu came off the bench in the All Blacks first game of the 2002 Tri Nations Series against South Africa, though he did not play in the rest of the tournament. He was, however, back in his starting position on the wing for a game against England in November. Lomu ended up scoring a double, though it was not enough to secure a New Zealand victory, with England winning 31 to 28. The subsequent match against France resulted in a draw, the first between the two nations in 96 years. The last match of the end of season tour was against Wales, which the All Blacks won 43 to 17. 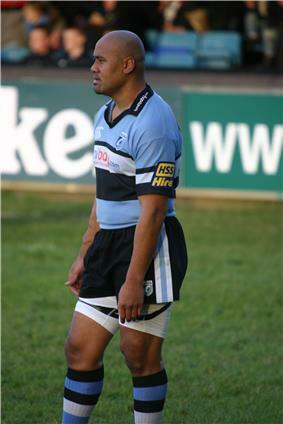 Jonah Lomu playing for Cardiff in 2006. Lomu is of Tongan descent. He has been divorced twice and is now living with his children and third wife, Nadene Quirk. He is the cousin of National Rugby League player John Tamanika. In December 2007, it was reported that Lomu and his second wife Fiona were "taking time out" from one another. Then in February 2008, it was reported Lomu and his wife Fiona were divorcing. The reason for the divorce was another woman. Nadene Quirk was married to fringe Auckland Blues rugby player Jarek Goebel when she met Lomu in late 2007. Goebel was devastated by what happened. Jonah and Nadene are now married and, in 2012, Lomu and his wife became members of The Church of Jesus Christ of Latter-day Saints. ^ "Jonah Lomu's rugby journey". BBC. 10 July 2002. Retrieved 22 July 2006. ^ "Sixth Induction Dinner – 2007". International Rugby Hall of Fame. Archived from the original on 2012-06-29. Retrieved 2007-09-13. ^ "RWC legends inducted into IRB Hall of Fame" (Press release). International Rugby Board. 26 October 2011. Retrieved 27 October 2011. ^ "Phil Bennett, 19 October 1997". UK: Sunday Mirror. 19 October 1997. Retrieved 2008-01-18. ^ "rugbyworldcup.com/statistics". International Rugby Board. Retrieved 2007-09-24. ^ "Lomu: A giant on any stage". allblacks.com. Archived from the original on 26 June 2006. Retrieved 22 July 2006. ^ "South Africa 1995". WRU. Retrieved 2007-10-05. ^ English, Tom (23 September 2007). "The giant who fell to Earth". Scotland on Sunday. p. 4. ^ "289th All Black Test: 992nd All Black Game". allblacks.com. Retrieved 22 July 2006. ^ "332nd All Black Test: 1050th All Black Game". allblacks.com. Retrieved 22 July 2006. ^ "All Blacks' Lomu remains hot property". sportsillustrated.cnn.com. 2 November 1999. Retrieved 22 July 2006. ^ "340th All Black Test: 1058th All Black Game". allblacks.com. Retrieved 22 July 2006. ^ Player Analysis: Jonah Lomu, Scrum, 11 March 2010. ^ Queensland rugby league article. Qrl.com.au. Retrieved on 2011-11-07. ^ Dye, Stuart (30 August 2003). "Lomu plans exclusive party". ^ "Lomu and wife 'take time out' from each other". New Zealand Herald. 7 December 2007. Retrieved 8 October 2011. ^ Come and See' Gatherings Help Those Looking into Mormon Faith"'". Retrieved 18 June 2012. ^ "New Zealand Herald". The New Zealand Herald. 2 December 2012. ^ Peace and Sport. Peace-sport.org. Retrieved 10 April 2013. ^ "Lomu fears he may end up in wheelchair". Telegraph. 10 Feb 2004. Retrieved 2015-03-16. ^ "Lomu makes inspirational return". BBC Sport. 2 Jun 2005. Retrieved 2015-08-27. ^ "Johnson XV 33–29 Lomu XV". BBC. 4 June 2005. Retrieved 22 July 2006. ^ "Lomu targets Sevens comeback". rugbyrugby.com. Retrieved 22 July 2006. ^ "Lomu signs North Harbour contract". BBC. 8 April 2005. Retrieved 22 July 2006. ^ Leggat, David (10 August 2005). "Lomu puts injury time to good use". nzherald.co.nz. Retrieved 22 July 2006. ^ "Lomu to see action with Cardiff". rugbyrugby.com. Retrieved 22 July 2006. ^ "The All Black in Blue – Jonah Lomu signs for Cardiff Blues". cardiffblues.com. Archived from the original on 8 March 2006. Retrieved 22 July 2006. ^ "Jonah's return is picking up pace". icwales.icnetwork.co.uk. Retrieved 22 July 2006. ^ "Lomu returns to rugby". slam.canoe.ca. Retrieved 22 July 2006. ^ a b "Lomu concedes All Blacks dream is over". Scrum.com. Retrieved 3 October 2006. ^ "Lomu turns down Titans". Fox Sports – NRL. News. Retrieved 2008-11-13. ^ "Lomu considering return to Wales". BBC. 5 November 2006. Retrieved 2008-11-13. ^ "Honoured New Zealanders: Queen's Birthday honours list". New Zealand Herald. 4 June 2007. Retrieved 2007-06-04. ^ "Lomu out of Twickenham Clash". Press Association. Retrieved 2008-09-28. ^ "Lomu Plays for Aberavon Naval RFC". Pitch Hero. Retrieved 10 April 2013. ^ "Marseille close to signing Lomu". BBC. 28 June 2009. Retrieved 2009-06-28. ^ "Jonah Lomu finds success with bodybuilding". RugbyDump.com. 21 September 2009. Retrieved 2009-09-21. ^ "Jonah Lomu comeback for Marseilles-Vitrolles". RugbyDump.com. 25 November 2009. Retrieved 2009-11-25. ^ Jones, Nicholas (15 November 2011). "Lomu fighting – just not in the ring – National – NZ Herald News". Nzherald.co.nz. Retrieved 2012-03-08. Jonah Lomu has lent his name to various video games including Jonah Lomu Rugby and Rugby Challenge. His vital statistics have also become an oft-quoted demonstration of the problematic use of Body Mass Index as a measure of obesity. With a match-ready body weight of 120 kg and a height of 1.96m, Lomu had a BMI of 31, in excess of the value of 30 usually taken to signify obesity. However, his waist measurement of 69 cm implies a Body Shape Index consistent with a healthy weight. Lomu also made an attempt to take part in a charity boxing event in New Zealand called "Fight for Life" 2011, which he was intended to be the captain of the rugby union team. He was intended to fight the main event against former league player Monty Betham. On 14 November Lomu pulled out of the competition as he had just recently been hospitalised for over a week due to his failing kidney. In September 2009, Lomu took part in an amateur bodybuilding contest in Wellington. He revealed that he has lost weight since preparing in March and now weighs 115 kg. His weight loss was due to intensive gym work and a diet without carbohydrates. He claims he has not weighed this little since he left school at 19. He finished second in two categories, including the men’s open over-90 kg, and the mixed pairs. His partner Tracy suffered from breast cancer but also recovered like Lomu did. He also prepared for his comeback to rugby. He joined French Fédérale 1 team Marseille Vitrolles in November. Lomu made his debut against Montmelian, they won 64–13 at home. Lomu started the match at centre and was nervous but enjoyed the occasion very much. Lomu has now moved to number 8 successfully with Marseille Vitrolles Rugby, the position he played as a youngster in New Zealand. However, in June 2009, the BBC claimed he was close to joining French third division club Marseille Vitrolles and was expected to start in the first match of the new season. Later that year after recovering from the injury Lomu played in another charity match at Aberavon RFC's Talbot Athletic ground. The match was arranged by friends that Lomu had made during his playing days in Wales with Cardiff Blues. Lomu donned the navy blue jersey of the Aberavon Naval RFC, playing against a Port Talbot select XV made up of players from various local clubs such as; Aberavon Quins RFC, Baglan RFC & Taibach RFC in order to raise money for a local children's charity. The match was covered by the BBC rugby show Scrum V.
Lomu retired from rugby in 2007, but was persuaded to play in the Help For Heroes charity match at Twickenham a year later, although he had to withdraw after injuring his ankle in training. Lomu was appointed as a Member of the New Zealand Order of Merit in the Queen's Birthday Honours list on 4 June 2007. On 9 April 2007, Lomu appeared on New Zealand's version of This Is Your Life, in which he was united with his brother John Lomu. On 5 November 2006, the BBC reported that Lomu was considering a return to Welsh rugby. He last played rugby in Hong Kong to take part in the Tens competition. On 16 October 2006, it was reported that Lomu was close to switching codes and signing for the Gold Coast Titans, a new Queensland franchise in the National Rugby League competition. He was offered a relatively small contract of one hundred thousand dollars. However, the deal did not materialise as Lomu had numerous important sponsorship contracts with companies associated with rugby union and it would have proved difficult to reconcile these if he was to play in the NRL. It became apparent in early 2007 that Lomu was not going to make the Rugby World Cup after not signing with a New Zealand Super 14 franchise, therefore ruling him out for the 2007 Rugby World Cup in France. Previous to not gaining a Super 14 contract, Lomu had been demoted to the North Harbour 2nd XV. Lomu stated that he was disappointed by his failure to gain a Super 14 contract, but that he had not failed himself. It was subsequently speculated that Lomu may have played in Australia in 2007 for one of the then new national competition clubs. After three seasons of absence from rugby in New Zealand, Lomu played for Massey against Marist in the North Harbour club competition. Lomu was on for 30 minutes, making a blocking run before he twisted his right ankle and was subsequently replaced. Lomu said that it was "a small step" in his comeback. Lomu's aim was to return to the National Provincial Championship and reclaim his All Blacks jersey for the 2007 World Cup. Lomu ended up playing for North Harbour in round four of the National Provincial Championship, in a match against Wellington, playing in the last 26 minutes of the game. Harbour won the match 31–16. Lomu said after the match "For me it's a dream come true...I've always said this is my goal – to come back and play in New Zealand." One week later, he made his home debut for Cardiff at Cardiff Arms Park and played for the whole match. Again, he did not get onto the scoresheet but his presence was enough to create space for other players to score in a 43–16 win over Calvisano. In front of a record home crowd, Lomu scored his first try for Cardiff on 27 December 2005, with a man-of-the-match performance during a Celtic League 41–23 win against the Newport Gwent Dragons. In early 2006, he was sidelined while he concentrated on gaining speed and strength, stating that "I have now lost between 10 and 11 kilos". He got his first start since January against Border Reivers on Saturday, 15 April, but broke his ankle as a result of a cover tackle on him four minutes from time. He was denied a try, but managed to get the ball away for Mark Lewis to score the Blues sixth try in their 46–11 win. He was estimated to be out for six weeks, as reported by his manager and wife, Fiona Lomu, meaning the end of his Celtic League season. On 9 August 2005, he joined North Harbour, but the shoulder injury he had picked up in the Martin Johnson testimonial game ruled him out for the season, so he worked with the team in a coaching capacity. North Harbour agreed to allow him to play overseas during the NPC offseason, so Lomu signed with the Cardiff Blues of the Celtic League and began playing in Wales in December that year, though he would then return to North Harbour for the 2006 NPC season. Lomu made his first appearance in a competitive match since his transplant on 10 December, in Cardiff's away Heineken Cup fixture against Italian club Calvisano. He started the match and played 60 minutes, although he did not score, making a key line break leading to Cardiff's first try in their 25–10 win. Before returning to professional rugby, he needed special clearance from the World Anti-Doping Agency, as one of the anti-rejection drugs he was required to take is on the WADA list of banned substances. On 8 April 2005, he signed a two-year contract to play for the New Zealand first division provincial team North Harbour in the NPC. In January 2005, Lomu announced his intention to lead a team against Martin Johnson's invitational XV on 4 June 2005, at Twickenham. He scored a try in the first half of the Johnson testimonial, but injured his shoulder in the process and did not return for the second half, dampening an otherwise encouraging first appearance. As it turned out, his injury was more serious than originally thought; he underwent surgery on the shoulder, causing him to miss the 2005 NPC season. 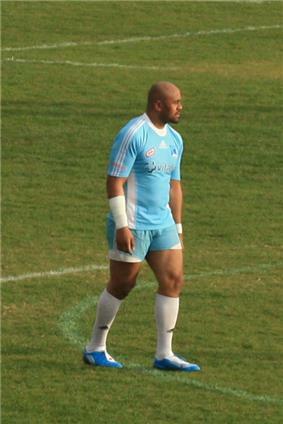 Jonah Lomu playing with French club Marseille on 22 November 2009. Late in March 2004, Lomu was quoted by a Hong Kong newspaper to the effect that a suitable live kidney donor had been found, and that he would have transplant surgery sometime during 2004. However, the former All Blacks team physician who was overseeing Lomu's treatment quickly denied the report. Nonetheless, at the end of July 2004 it was reported that Lomu had indeed undergone a kidney transplant on Tuesday, 28 July, in Auckland, New Zealand. The kidney was in fact donated by Wellington radio presenter Grant Kereama. At the end of 1995 Lomu was diagnosed with nephrotic syndrome, a serious kidney disorder. His rugby union career went on hold whilst the disorder was treated. In May 2003, the NZRFU announced that Lomu had been put on dialysis three times a week due to deterioration in his kidney function. Side effects of Lomu's dialysis treatment led to severe nerve damage in his feet and legs; his doctors warned him that he faced life in a wheelchair if a kidney transplant was not performed soon.